The most highly awarded Amstaff in Australian history – and bred by Zican’s! 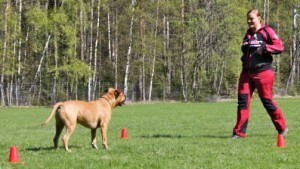 The American Staffordshire Terrier Club granted him the ROLL OF HONOUR – The only Amstaff to ever receive this most prestigious award. In order for a dog to achieve the Roll Of Honour, they must be of the highest quality, and also be able to produce quality offspring. They must be elite in physical structure and beauty, winning the biggest shows and awards. These include BEST IN SPECIALTY SHOW, BEST OF BREED at a ROYAL SHOW, BEST IN GROUP at a CHAMPIONSHIP SHOW, plus they must also be a GRAND CHAMPION. 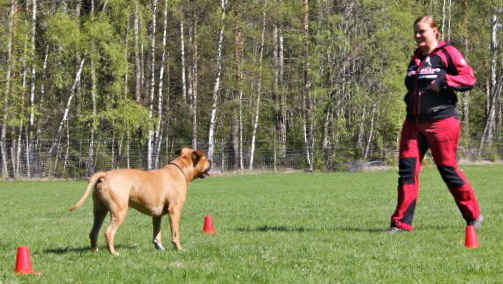 In addition to the show wins, the dog also must prove itself, by producing 5 champion offsprings. 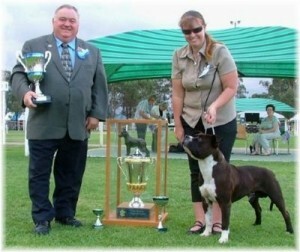 Mojo has far exceeded this requirement, with 26 champion offsprings, making him the number one stud dog in Australia.